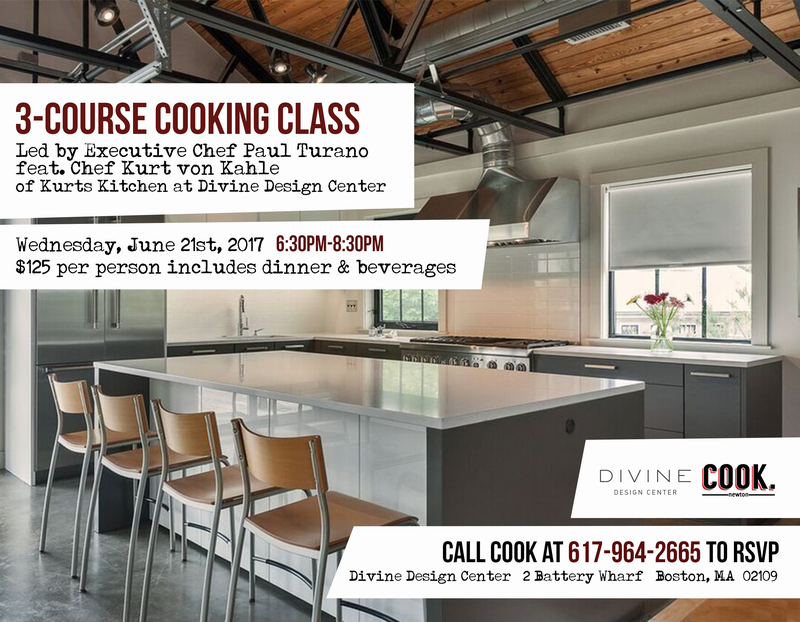 On Wednesday, June 21st, 2017, our Executive Chef/Owner Paul Turano will co-host two intimate cooking classes at Divine Design Center located at 2 Battery Wharf in downtown Boston! Award-winning Chef Paul Turano will be joined by Kurt von Kahle of Kurt’s Kitchen, chef and kitchen appliance expert, will teach students how to cook up a mouthwatering three-course menu based on classic Cook dishes while utilizing top-of-the-line appliances in Divine’s state-of-the-art showroom. Don’t miss the chance to learn first-hand from the industry’s most seasoned professionals. Tickets are $125 per person and include a cooking demonstration and three-course meal with beverages. For more information call 617.964.2465.